Harp Guitar Music is extremely proud to be the exclusive U.S. source for the ultimate Taraffo compilation! A special 16-page English booklet created specifically for Harp Guitar Music is included, along with an 8-page Italian booklet. Arguably the most historically important authentic harp guitar music of all time, this amazing collection of rare 78 recordings will astound anyone who thinks they play the harp guitar. 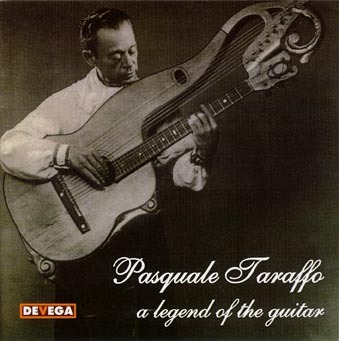 A true virtuoso, on a harp guitar with 8 chromatic sub-basses, Taraffo's style and technique has never been duplicated! Includes 41 tracks recorded from 1926-1930. 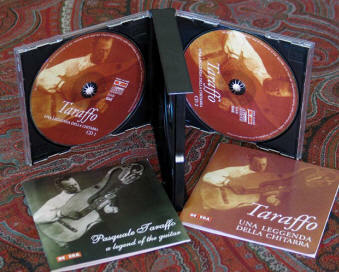 Taraffo performs 23 incredible solos, often sounding like three guitarists at once. He is joined on the remaining tracks by his brother Pietro on second harp guitar (another brother Rinaldo subs on 2 tracks), Pietro on harmonica on 2 tracks, with Nino Catania on mandolin on 2 tracks, and 6 tracks with Italian opera singers, including baritone M. Sartori, Mario Cappello and Zara Prima. 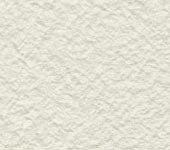 For much more information, please check back for a monumental co-work in progress on the life and career of Taraffo on Harpguitars.net! * Be advised that normal hiss, pops, and other normal record noise from the original 78 recordings is present to some degree on all tracks.